Can be attached to a belt loop. 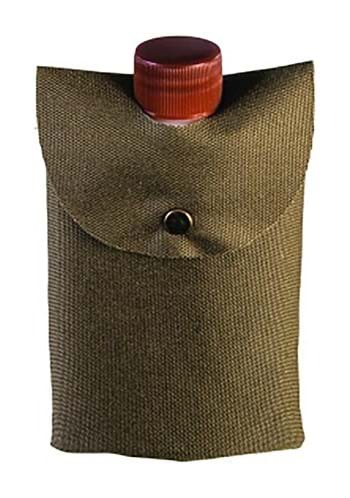 Great for military costumes or short hiking trips! They've been used for decades now. More than that actually. Researchers have found evidence of early humans using ostrich eggs as canteens as long ago as 60,000 years ago! We've since refined them quite a bit and now they are the signature shape that the military uses to this day! It's a huge deal for those soldiers to have water in the desert and they count in these guys to keep it insulated and hygienic. Stay hydrated as you brave the desert sun! This Combat Hero Canteen is designed to hold all the water you'll ever need for a day's journey. Actually that's not true. This canteen is not meant to be an endless supply of a refreshing liquid. If you believe that you may be dehydrated already. But if you find something that works that way after you make sure it's not some sort of mirage you should let us know!